Larkfield Housing Association is celebrating its 20th anniversary as a landlord. In February 1997, Larkfield acquired 565 homes following a successful transfer from Scottish Homes. It now owns and manages a stock of 391 properties and provides management services to an additional 566 owners locally. During the last 20 years, Larkfield has invested over £8 million on improvement works to its homes, working and delivering customer-centered services within the heart ofthe Larkfield community. Larkfield is celebrating not only its 20th anniversary as a landlord but also its 10th year as a subsidiary of the Link Group. At the time Larkfield joined Link, it was the first example of a Scottish RSL having another Scottish RSL as its parent company. 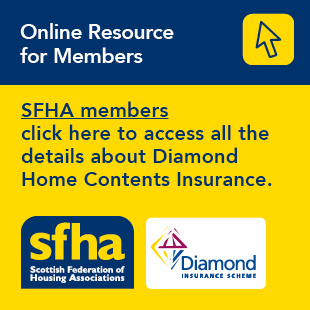 In 2008, Larkfield took on the management of 243 properties in Port Glasgow which had been transferred to Link from Port Glasgow Housing Association. Since then, Larkfield and Link have worked together to improve services for customers whilst expanding community and housing support activity in the Inverclyde area. Larkfield will kick-off a year of community events, celebrating its anniversary with a tenant open day on 28 February. This will provide an opportunity for staff and committee members to celebrate with tenants and community stakeholders. “We are delighted to celebrate our 20th anniversary. At Larkfield, we believe in creating communities which people want to live in, which is why we are committed to providing quality affordable homes and services that meet the needs of our local neighbourhoods. Pictured: Larkfield celebrates its anniversary.